Click Here to watch where your recycling goes!! Recycling helps save resources, energy, and money. It keeps materials out of the landfill, provides jobs, combats global warming, and “closes the loop” through the creation of new products out of recycled materials. Below is a list of all the items NRWS accepts in their curbside recycling program. Please, remember that every time you buy something made from recycled material you close the loop and help to sustain the recycling process. Please read below for what materials are recyclable through our company and the various ways you can help reduce your waste to help sustain our planet. Newspaper, Magazines, Catalogs, Glossy Paper, Brown Paper Bags, Paper Packaging, Egg Cartons, Milk & Juice Cartons, Carbon-less Paper, Office Paper (all colors), Phonebooks, Soft back Books, Envelopes (with labels or windows), Junk Mail, Shredded Paper (in clear bags for employee safety), Box Board (shoe boxes, cereal boxes etc.) and Cardboard (please break down). Paper with plastic coatings (laminated paper or photographs), Tyvex (non- tearing envelops). Click here for Tyvex recycling. Plastic film packaging - that includes all plastic bags and non-rigid plastic packaging (i.e. numbers 3 through 7) like food wrappers, chip bags, plastic wrap that comes around a case of drinks, plastic shipping air pillows etc. Not Sure? Go to the Waste Wizard Search Engine and type in the material to find out where it goes. Aluminum Cans & Aluminum Products ( foil, buttons etc. ), Tin & Steel Cans, Empty Aerosol Cans, Small Scrap Metal (36" or less), Pots, Pans, Utensils, Hangers, Metal Fixtures, and Lids from Jars. Large Metal items can be brought to the Recycling Center for Free Disposal. Please No: Electronic or Computer Equipment. These items are illegal to throw into the trash, you can drop them off for FREE at our Recycling Center Monday - Saturday 9 a.m. to 4 p.m.
All Beverage and Food Containers (labels okay), Lids okay please leave lids on container. Please Rinse and Empty. Please No: Fluorescent Tubes/CFL's (go to HHW), regular incandescent light bulbs (go in trash), window glass, mirrors, drinking glasses, or ceramic. 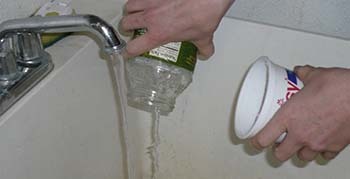 Rinsing plastic and glass containers help to keep paper products clean. Because single-stream collects all recyclables at once to encourage people to recycle more material, it does help to take a few seconds to make sure containers are completely empty and to give them a quick wash. Plastic and glass manufacturers don't have trouble with some residual ketchup on bottles; however paper manufacturers do because they do not use large amounts of heat. When paper is contaminated with too much material they have to throw it away. So when containers are not cleaned out they risk contaminating thousands of other peoples recycling efforts. Caps and lids of containers are recyclable; however most of the time they are made from a different material than the container, including plastic bottles. Caps should be left on containers when placed into your recycling cart (Please note that if you are taking CRV items to the Buyback Center caps need to be off).